In promotion for his new movie, My Name Is Bruce, Dark Horse Comics will be releasing a 12″ Bruce Campbell action figure. The fully articulated doll is formed from a 3-D scan of Campbell himself. 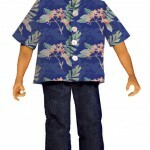 Besides a custom fabric miniature version of his actual Hawaiian shirt, which was loaned to us by Mr. Campbell, proving that he’s the kind of partner who would “give you the shirt off his back,” an array of movie-specific accessories are included. Two of these are miniature “angel” and “devil” versions of Mr. Campbell. They attach to his shoulders using hidden magnets.